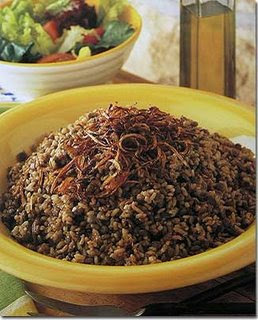 A fully nutritious meal, Mjaddara is easy to make and very tasty. Wash the rice and cover it in hot water and leave aside until the lentils are done. Cut the onion in stripes and fry in vegetable oil until golden brown. Drain the water from the lentils and from the rice as well. Place the rice on top of the lentils in the pot and mix. Add a teaspoon of vegetable oil, and mix the ingredients together over medium heat for two minutes. Add salt, pepper, cumin, and cardamom to taste. Cover with hot water (1 cm above the mixture). Let simmer on low heat until the water evaporates (about 15 - 20 minutes). Turn over (like a cake) in a big plate, and cover the top with the fried onion stripes. Serve with yogurt and green salad. Variation: half the onion stripes can be added tothe mixture before adding the water and letting itsimmer. The remaining onion stripes can be used for garnish.